As part of the provost’s plan to make Temple a destination campus, Honors students will be offered on-campus housing. In an effort to make Temple’s Honors Program more competitive among those at other universities, the university will be offering the option of four-year guaranteed on-campus housing within the Honors Living-learning Community for the incoming class of 2014, as well as some current Honors freshmen. LARA STRAYER TTN Nearly 500 Honors Program students call 1300 residence hall home. Freshmen and sophomores can opt to live in the Honors Living-learning Community within the dormitory, but only 45 percent choose to stay. “It’s an option that we are using as a recruitment and retention tool, to not only bring high-achievement students to Temple, but to keep them at Temple,” Honors Program Associate Director Amanda Neuber said. 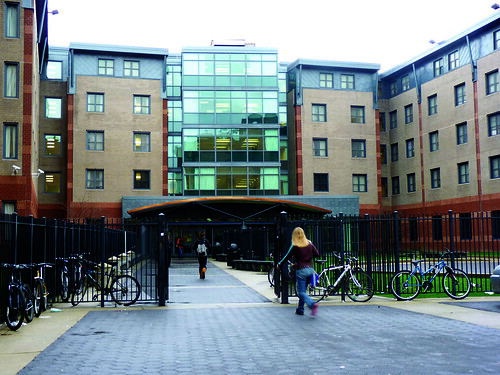 The four-year Honors housing option was announced in April 2009 as a part of Provost Lisa Staiano-Coico’s Academic Compass initiative, the aim of which is to make Temple a “destination campus” in the next five years. Currently, 90 percent of Honors students who live on campus live within the Honors Living-learning Community in 1300 residence hall. The community consists of 342 freshmen and 150 sophomores and occupies roughly half of the dormitory building. Housing located outside the Honors Living-learning Community will not be guaranteed to Honors students as part of this opportunity. Temple offers a variety of residential communities that include academic as well as co-curricular programs. Some students said they disagree with the nature of the Living-learning Community program, which aims to cluster students with similar majors or interests in housing. One such student is Honors freshman Alex Wright, who opted not to live in the Honors Living-learning Community. “It’s like staying within a clique in high school. If you’re not experiencing diversity, you’re not experiencing Temple,” Wright said. In the past, Honors students who opted to live within the Honors community were guaranteed housing as freshmen and sophomores as long as they met all outlined due dates. To accommodate current Honors freshmen who wish to remain in the community for upcoming years, Neuber said she hopes to expand the community to the fifth floor of 1300. The Honors Program and housing are still in discussion about the guaranteed-housing option. There are no plans to make 1300 exclusive to Honors students. “At other universities, it’s standard to offer incoming Honors students the option to Honors housing for four years. We are trying to make that opportunity available to Honors students at Temple,” Senior Vice Provost for Undergraduate Studies Dr. Peter Jones said. At a time when on-campus housing is difficult for freshmen and sophomores to obtain, some students questioned the fairness of granting Honors students the opportunity of four-year assured housing. “I’m not crazy about it. There are other groups of people who need guaranteed housing as well. I’m from out of state, and it was difficult for me to get housing my sophomore year. For me, commuting was not an option,” senior public relations major Jessica Maccini said. Temple has plans to add more housing to Main Campus. The 20/20 framework outlines plans to build two new residence halls to accommodate more students, one of which is estimated to be finished within the next two years. “Our hope is that what we are currently doing for Honors students is something that we are going to be able to extend to most students in the future. We at least hope to make the offer of two years of Temple housing more widely available to students,” Jones said. “I don’t want to displace a large number of students. I feel comfortable doing this now because by the time the Honors students who wish to exercise this option are juniors, the new residence hall will be built,” Neuber said. Less than half of all freshmen Honors students currently opt to stay in the dorms for a second year. Approximately 45 percent of Honors freshmen who live within the Honors Living-learning Community choose to return for sophomore year. “I really feel like they won’t have a large demand for junior and senior Honors housing. I think that living off-campus is a necessary step to take before you graduate,” freshman philosophy and religion major and Honors student Jordan Greenwood said. “I think that a majority of the four-year honors housing option has to do with satisfying parents who are safety conscious,” freshman English major and Honors student Zach Cettin said. Some benefits of living within the Honors Living-learning Community include Honors residential programming, conveniently located Honors advising offices and easy access to a technology-equipped classroom. “I’m really glad that I live there. The Honors Living-learning Community is a great way to get to know everyone in your classes. It’s like a built-in way to make friends,” Greenwood said. Along with the incoming Honors freshmen class, a small percentage of the current freshmen will be granted a four-year guaranteed housing option within the Honors community. Current sophomores, however, will not be given the opportunity to remain in the community for junior year. Karen Blyton can be reached at karen.blyton@temple.edu. The university could be doing more to teach students about off-campus housing. With more students living on campus, the Board of Trustees has voted to raise the rates for housing to fund the demand. Robert Berry splits his time between Main Campus and the Department of Homeland Security. My son was accepted at Temple for 2012/2013, but opted to go to a local Connecticut school due to finances. Now that he has received an NROTC scholarship for his remaining 3 years, he will be going to Temple. He has excellent grades. What are his chances for on-campus housing? I, as a parent, am very concerned about his safety considering the location of Temple. It seems to me that Temple is way behind in the amount of housing it has considering all of the out of state students. Sending them into the neighborhoods for 3 or 4 years,with certainly no chance of housing as jrs. and srs. is crazy.